Bangkok is, without a doubt, one of our favourite cities in the world. I have been here maybe ten times, and every time I fall in love with it again. I love the energy, the vibrancy, the people, the culture, everything really! Coming to Bangkok with kids was more challenging when we came here two years ago. The kids were only 11 months old and 2 then. The slow moving traffic and the crazy amount of stairs at the sky train made it hard to get around and lead to lots of tears. This time, however, our kids were 3 and 5 and we had an awesome time! If you are wondering what to see in Bangkok, where to stay, how to get around, etc etc, you will find all of the answers below! 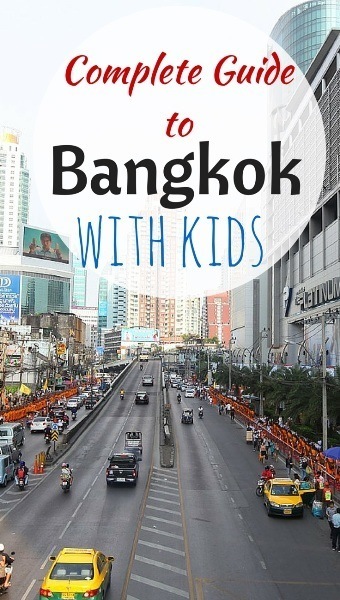 As well as our must visit places in Bangkok for kids. 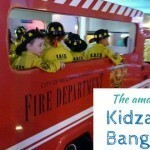 If there was one place we HAD to visit in Bangkok, it was KidZania, and we are so glad we did. If you are looking for the best Bangkok kids’ attraction, then we think this is it. KidZania is actually a chain of edutainment centres you can find in a growing number of countries around the world. Basically the kids enter a world made for them – where they have to work to earn money and can then use this money to buy things or experiences, much like in the real world. It is basically all about role playing, and role playing in a way to teach the kids. We found it absolutely amazing. The kids had the chance to put out fires as firemen, become police people, dentists, perform an endoscopy, bottle coca cola, learn to be pilots, sushi chefs, make hamburgers at McDonalds and serve other kids at a 7/11. They also did many other things and that was only the tip of the iceberg of all the experiences available. Their favourite part was that they got paid for all of this and then they were able to use the money to buy other experiences – like they both had a makeover. It is truly an amazing place and one the 4 of us enjoyed. 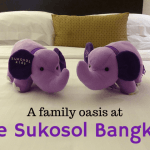 If you only have time for one big Bangkok attraction for family, this should be it! Read our full review here or click here to buy discounted tickets for KidZania Bangkok. If you are looking for kids activities in Bangkok then this one is a winner with young kids. 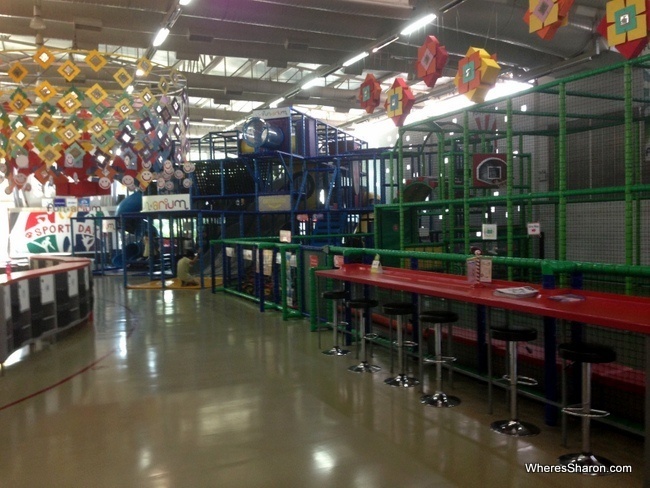 Funarium is a large and very cool play centre in Bangkok, just off Rama IV Road. There is a lot to do here. There’s a massive structure to climb all over and slide down from complete with a cool ballpen that had big vacuum tubes that sucked balls in and spat them out somewhere else. There was also a mini indoor soccer field, basketball court, a rock climbing wall and an art room with smocks, paint, brushes and pencils all set up to go. Best of all – and S and Z’s favourite – an indoor bicycle track, complete with bikes and scooters and helmets. Everything is well protected and safe. The kids can’t leave the centre except with the right adult(s), and there’s not much that can hurt them except other kids and the floor. Staff supervision is excellent – they even helped the kids in the toilets when they ran off without me – and the staff all spoke good English. Food wise, there is a decent cafe with coffee, cake, sandwiches, rice dishes and pasta in addition to the usual suspects. Most dishes were a reasonable 100 to 200 baht, but that does add up. There is not much in the way of snacks, other than lollies/candy, though. You need socks for the kids (adults too, if they’re going to be on the equipment) and you can buy them there if need be. The only other tip I’d have is get there early if you can. We did and had a lot of the centre to ourselves. The kids had a great 4.5 hours. It’s a great place to run around! Entry currently costs 200 baht for kids under 105cm, 320 for kids under 13 and 110 baht for everyone else. This is for three hours on weekends and public holidays (longer if the centre is not full) with extra time payable if you go over (30 baht for small kids, 60 for bigger ones per half hour). Outside of weekends and public holidays entry is good for all day. You can find more information on their website. 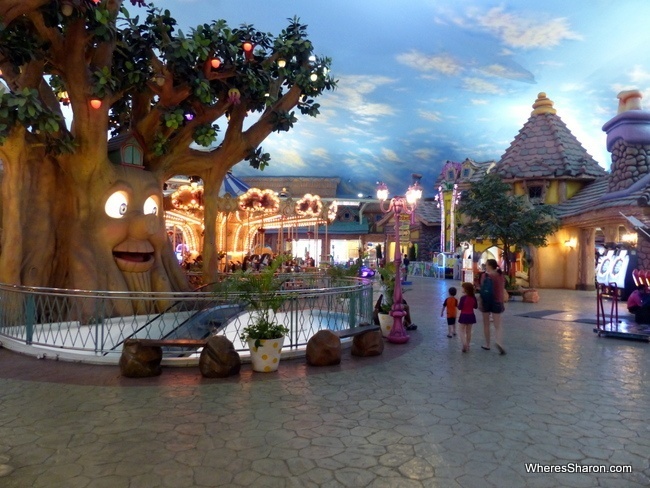 The next item on our list of things to do with kids in Bangkok is Fantasia Lagoon Water Park. 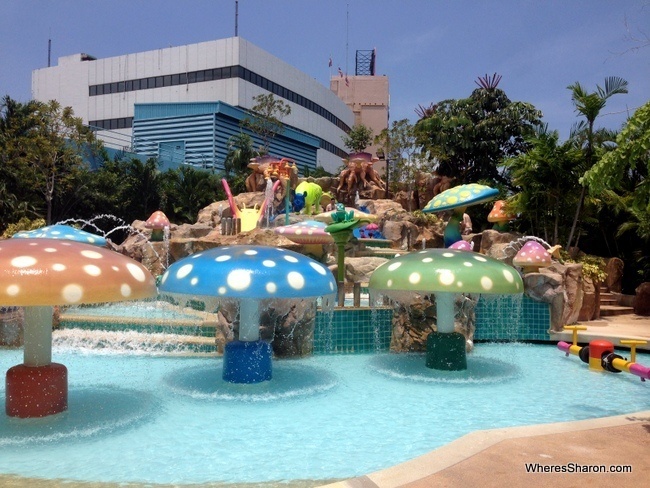 This little known water park is located on top of a shopping mall about 40 minutes drive from Siam Square. There are two water slides, a lazy river like ride (where you float around on a raft – extra cost) and kids’ water playground areas. It’s the perfect way to cool down on a hot Bangkok afternoon. 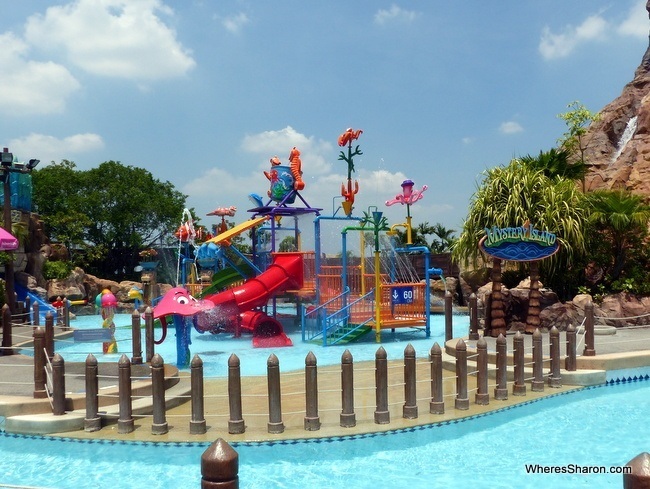 It is a nice place and the kids enjoyed the water playground areas, especially the youngest area. The other playground area, unfortunately, had just a bit too much water squirting all over the place which stopped it being enjoyable after about 5 minutes. One of the water slides wasn’t running during our visit and a whole section of the park was closed down. On the upside, there was barely anyone around. Everything was well supervised, perhaps too much so! I always felt like the kids were safe because of this which is fantastic. However, there seemed to be many little rules which often did not make sense and we had whistles blown at us a lot because we were apparently doing the wrong thing! I wanted to be left alone. The kid playground areas were nice and clean. However the other parts were not quite as clean as I would like. The one running water slide also did not go very fast and emptied into a pool that was only 80 centimetres deep – this meant that if you finished with any speed, then you got a very sore bottom when you whacked the bottom of the pool! There are places to eat and the setting is nice. If you have young kids, it may be worth the track out here to cool down and have some fun – and our kids did love it. However, I would definitely not bother with older kids, teenagers or just adults. There is not much here. There are some places to eat in the park and there is also a small indoor amusement park on the way to the water lagoon. It is also not very exciting but can entertain young kids for a little while. To get here, you will have to take a taxi. It may take a little while to find one that will take you here. We ended up having to pay a flat rate to get here from The Sukosol of 300 baht. On the way back, we got a metre taxi which cost about 230 baht. Entry is 200 baht for adults, 120 baht for kids over 80cm. There are lots other little charges you will probably need to pay too and all the other charges (like for a mandatory swimming cap, locker, towels, raft for lazy river ride, etc) also involve a deposit. They are cheap but it does add up. More information here. It may surprise you to see this place to visit in Bangkok on a list of kid attractions, but Khao San Road can be fun for everyone. This backpacker strip seems to have a bit of a reputation which I must admit that I don’t entirely understand. It’s full of foreigners, but that means most people speak English and it’s a very easy place to be. 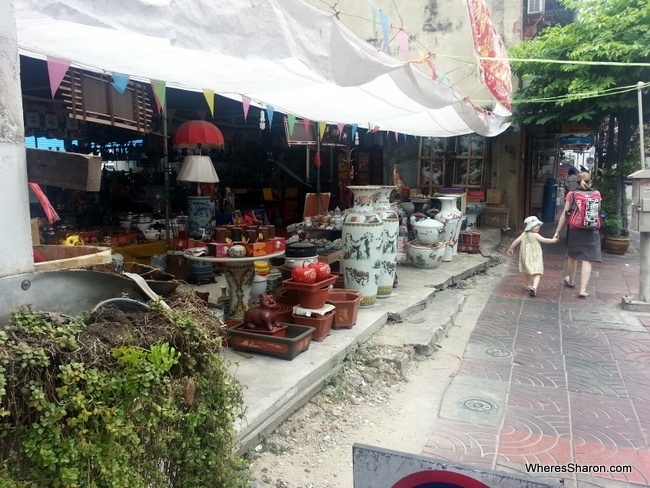 There are lots of market stalls and good places to eat as well as cheap massages. There’s some tips on things to do on Khao San Road here. The Grand Palace is a complex of buildings not far from Khao San Road and is one of the most popular attractions in bangkok. There are halls, pavilions and buildings all set around gardens and courtyards. It’s a bigger site than you might imagine and it works well with kids with its bright colours and outdoor space. This giant aquarium is one of the best things to do in Bangkok with family. Located in the Siam Paragon Shopping Centre (same building as KidZania), it is very easy to get here and explore this aquarium. Warning: this attraction is not cheap! I recommend you buy tickets beforehand from Klook Travel. At the time of writing this, tickets were just about half price through Klook compared to buying at Ocean World. See the latest prices here. 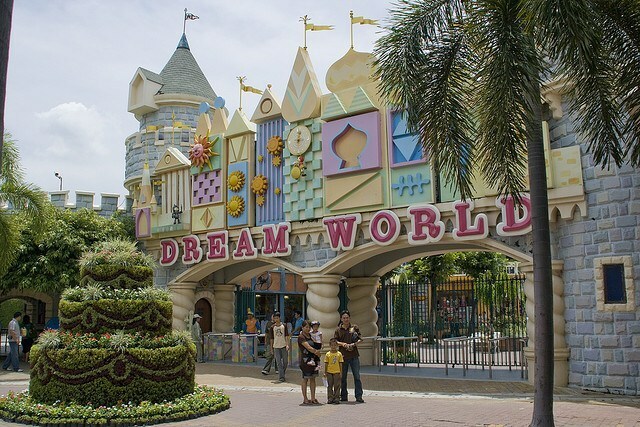 Dream World Bangkok is a theme park that is meant to be like a mini Disneyland. 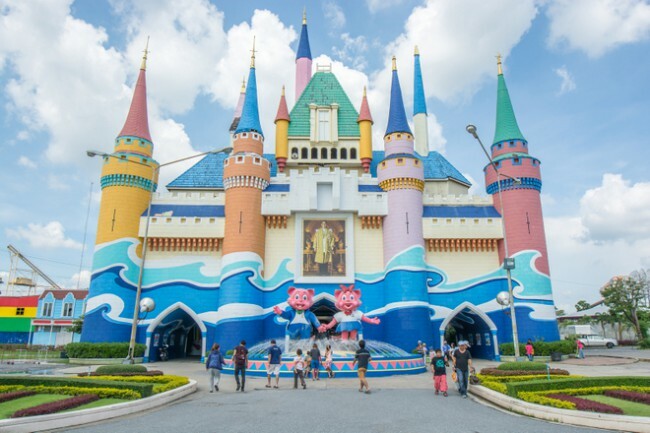 It is beautifully presented and full of Bangkok kids’ activities – including rides, a water playground and “snow town”, where you can actually play in the snow. Unfortunately, S was sick the day we planned to go here but it sounds amazing and perfect for young kids. I recommend buying discounted tickets beforehand from Klook Travel. This saves time and money. Click here to see the latest prices. If you are looking for places to visit in Bangkok that are full of rides, then this is the right pick for you. Similar to Dream World, this theme park works better for older kids who want more thrilling ride options. It is also located closer to the centre than Dream World (which is a long way out), making it an easier option. We caught the ferry here along Chao Praya which was part of the fun and a worthwhile activity for kids in Bangkok by itself. It’s easy and the kids loved it. Straight after we left the ferry terminal we were surrounded by lots of market stalls and many admirers of both the kids. It was fun walking around, and we quite enjoyed it. The footpaths were narrow though, and we didn’t get to explore the many lane ways filled with stalls as the craziness of people and traffic was a bit much with young kids. We basically walked between the river ferry and the metro station with lunch along the way (lots of dumplings, I was in heaven). It is definitely an area worth checking out. Another of the things to do in Bangkok for families, particularly if you like animal attractions, is Safari World. 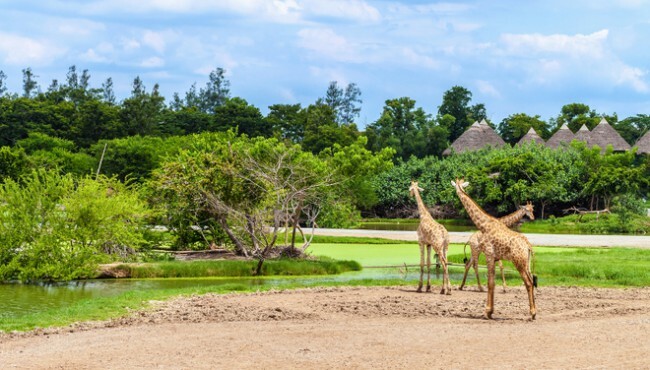 This highly rated park consists of an drive through animal safari section and a zoo area with animal shows. Some of the attractions include bird and dolphin shows, sea lions and jungle cruises. Dusit Zoo is a great choice for a central zoo option in Bangkk. It is much simpler than Safari World and is also much cheaper. There are also reviews that suggest the animals are not as well cared for as we would like. Find out more information here. This my favourite shopping centre in Bangkok and we go every visit. 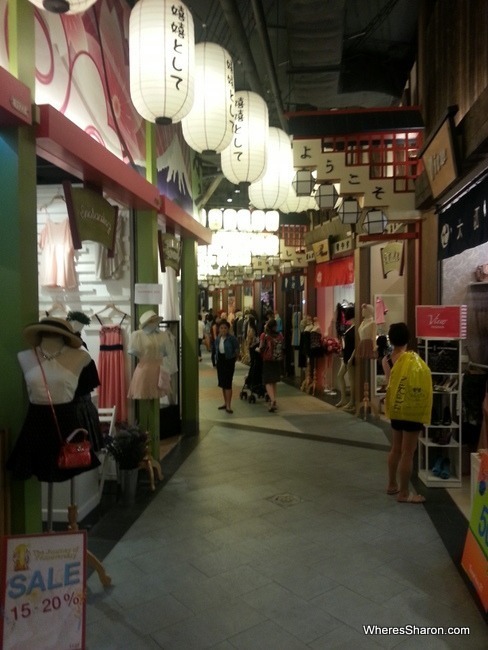 It’s packed full of shops and bargains as well as cinemas, games, massage parlours and some great eating options. It is easily accessible on the BTS at National Stadium stop. 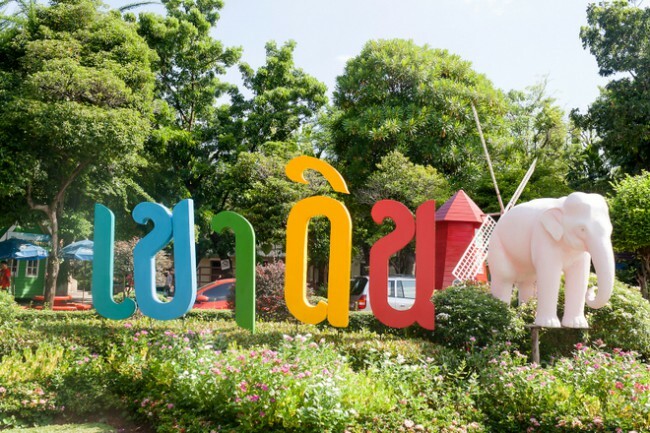 If you are looking for some green space to get rid of some excess energy than the massive Lumpini Park in central Bangkok is a fabulous way to go. There’s a playground, lots of walking paths, many people jogging, an outdoor gym, paddle boats and row boats. It’s especially nice in the evening. The big flashy night market is a great way to spend an evening. 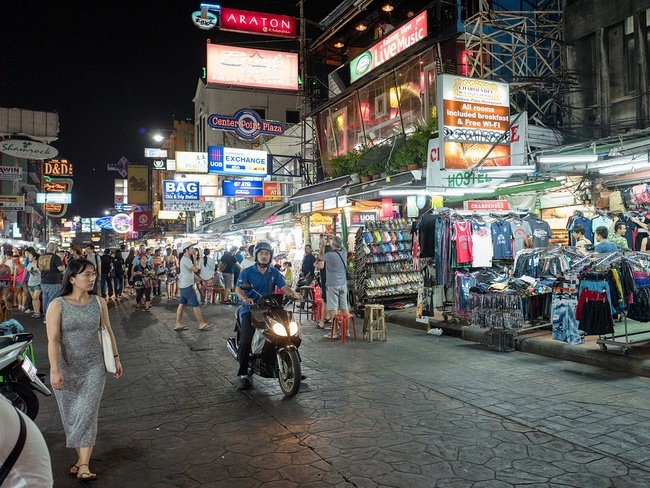 It’s more than a night market really – more like a large shopping complex with many dining options. It’s the most upmarket night market I have been to! There’s 4 different complexes ranging from the Factory District filled with 1500 small shops to the Waterfront District filled with fancy restaurants and event venues. There’s puppet shows at the Joe Louis Puppet Theater. 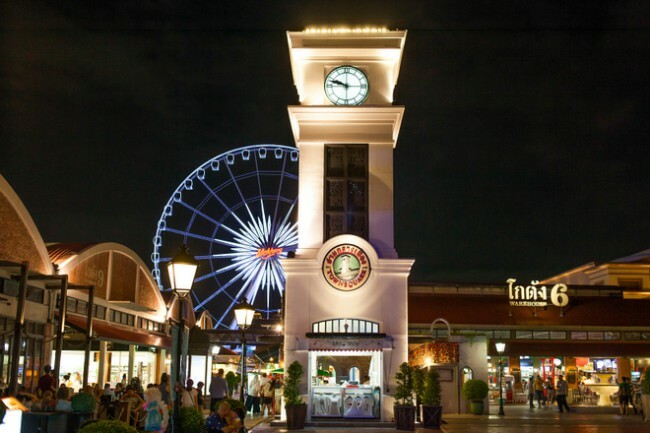 While here you can also go on Asiatique Sky – the big wheel you can see in the photo above. I especially enjoyed arriving here by boat from Saphan Taksin sky train station. This shopping centre is a new favourite of ours, located right on BTS Asok. What we love about this shopping centre is its airport theme. Throughout the shopping centre you are visiting different terminals which lead to different cities. This means there is a London themed area, Tokyo, San Francisco, Istanbul, Rome and many others. It’s fun spotting landmarks and other cultural things from the different locations. There is also a great Mexican restaurant if you are craving something different. This playland incorporates 19 different zones and is somewhere your kids are going to love! Situated at the Emporium Mall by Phrom Phong sky train station, it is also easy to get to. It’s not just about fun, but aims to educate kids as they play. There is a big range of activities involving art, technology, music and literature which are aimed for kids from toddler age to 14! Attractions range from an inflatable mountain to climb to a “jungle” filled with colourful nets and bouncy grounds for kids to navigate. What makes this Bangkok kids attraction stand out, though, is its use of technology. There are activities like “Wonder Car” that allow the kids to “paint” a life sized car and then email it home. This is a great place to go so the kids can let off some excess energy! 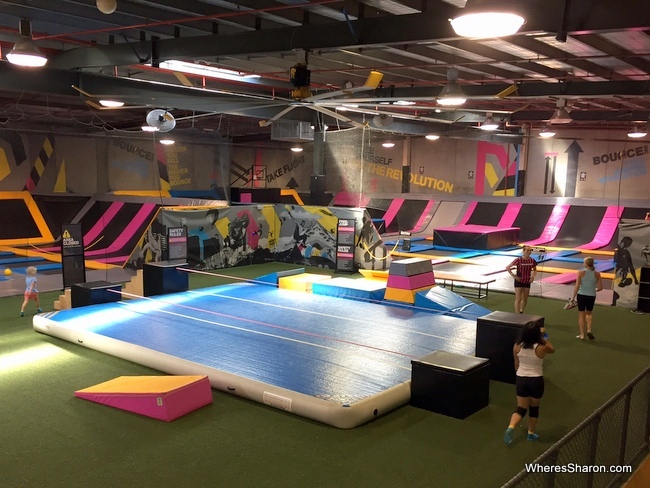 Basically a massive trampoline park, these places are lots of fun. We have not been to the Bangkok option (it’s new) but we have been to the same franchise in Melbourne and love it. Kids need to be three years old to join in on the fun. You are not going to have any problems finding family friendly hotels in Bangkok. They are everywhere! Here are some hotels we can personally recommend as well as a great Airbnb apartment for people who want more space and are visiting for longer. This beautiful hotel is a great choice for families who want a great 5 star hotel for a very reasonable price close to the action. 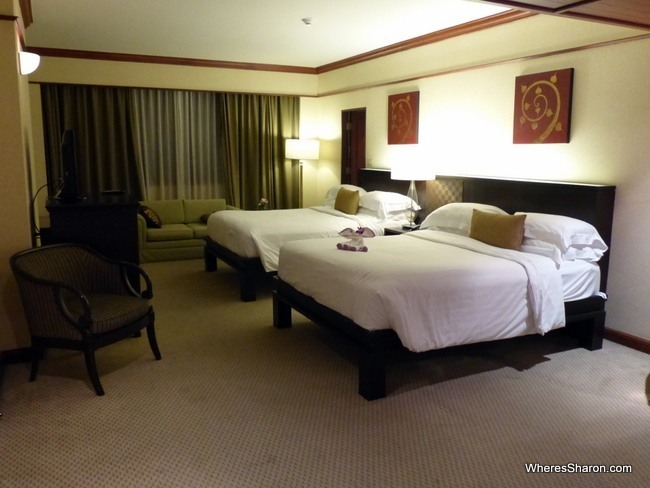 There are family rooms as well as a Mini VIP program. The breakfast has some of the best pastries I’ve ever had and we enjoyed the swimming pool. This is a fabulous choice. Click here to see the latest prices or to read our full review. The Centrepoint Ploenchit is a great choice for best family hotel in Bangkok if you would like a serviced apartment with hotel facilities in a good location. We stayed in a suite, which is a big one bedroom apartment. It was just fabulous and came with everything, including a washing machine/dryer. 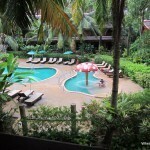 The hotel also has a pool, kids’ pool, playground and kids’ play room and is well located. This is a great choice for families. If you like big, tasteful hotels with good facilities in an awesome location, then Pathumwan Princess ticks all these boxes. 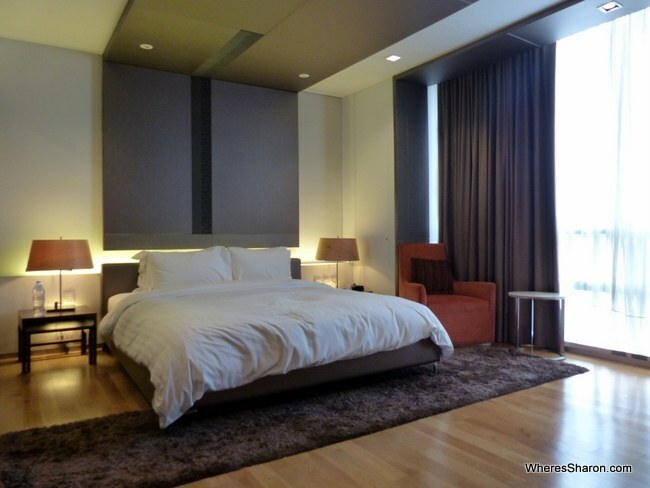 We love this hotel primarily because it is above MBK, our favourite shopping centre mentioned above. It also has a lovely big pool, comfortable, big rooms and is just a nice hotel. If you are after something budget in a convenient location, the simple 507 Residences is great value for money. 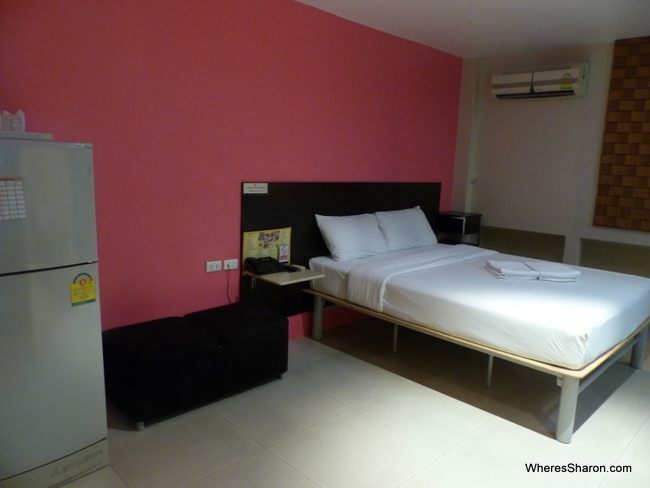 The rooms are simple but clean and come with fridges and air conditioning. It is in a convenient location near Victory Monument and we used this hotel for a quick one night stopover between flights at Don Mueang Airport. It’s an easy bus ride from there. If you are in Bangkok for a week or so, you might want to consider an Airbnb apartment. We stayed in a great one for our last week in Bangkok. We had a two bedroom apartment, fully furnished with a full kitchen. There were communal washing machines on site. There were also multiple pools (including an area perfect for young kids), a playground, gym, shop, tennis courts and restaurant on site! The best part was that this all came at only about AUD$50 a night. Its about a 15 minute walk with little legs to a BTS train station which is 8 stops from Siam Square. 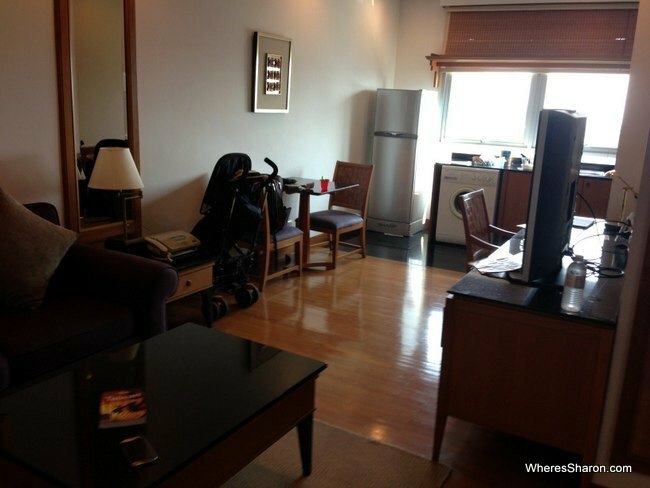 For this reason, I recommend this apartment primarily for people who are coming to Bangkok for awhile or have been before as it is not super convenient with young kids, although it is not far from Funarium. 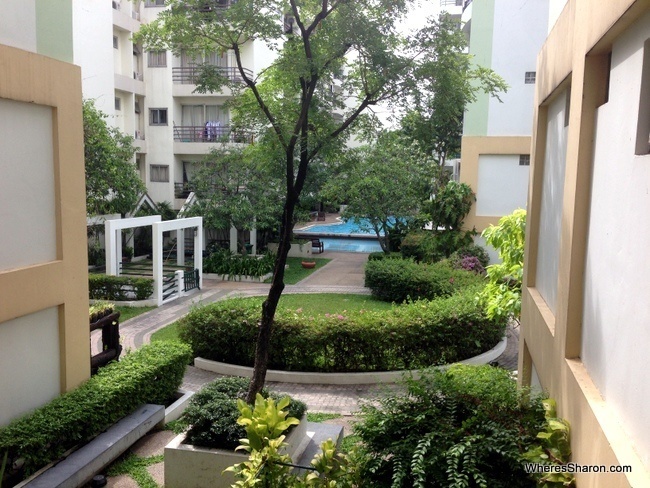 We enjoyed the area around the apartment and it felt nice to be in a nice local area in Bangkok. You can also read our full article about the best family hotels in Bangkok. 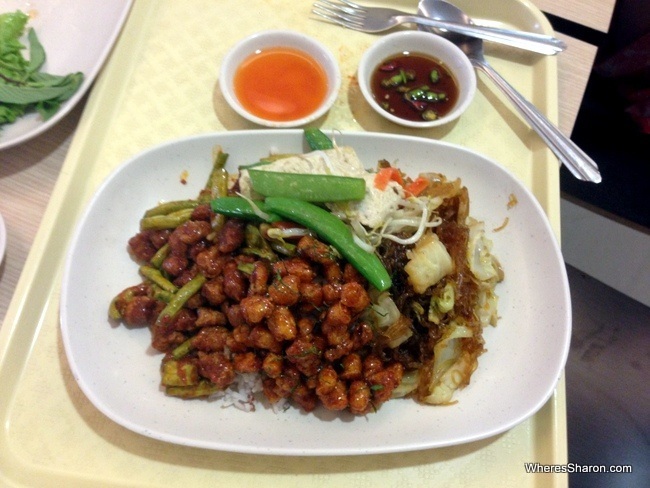 It is very easy to eat in Bangkok – this is a foodie’s delight with good food everywhere.. well except if you are vegetarian! The food is cheap and it’s also possible to self cater if you stay in an apartment. On our first trip with kids when they were 11 months old and 2, we self catered some lunches at the Centrepoint Ploenchit so they could have something more similar to what they would eat at home and pack them full of vegetables – there are plenty of vegetables here but they aren’t always ones that the kids were used to eating (and thus open to eating). If you are wanting to self cater, this article is a great guide to online grocery shopping in Bangkok which can make things much smoother on your arrival. It is no cheaper to cook than eat out though, so we ate out all the time on our second trip. On our most recent visit, I was vegetarian and I found it very hard. Vegetarian dishes are thin on the ground. For the first few days of our 2 week visit, we were with a friend who was Thai and she usually had to chat to the staff for awhile to find something for me! I ended up starving and feeling very disappointed. 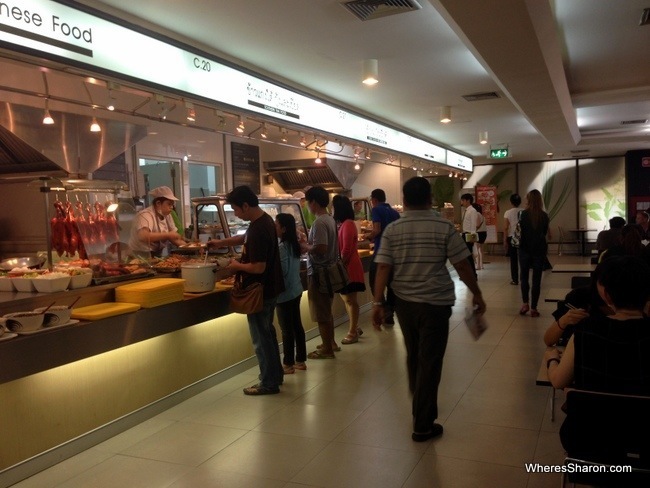 The only time I had a great meal was at the food court at MBK. This place is superb for everyone. This is super easy as long as you don’t have very young kids. We found this complicated last time, when they were too little to climb up all the BTS station stairs (stops for the sky train) but too big to be carried up all of them. Now they are older, it was fine. There are taxis everywhere and they must be some of the cheapest in the world – we usually found them cheaper than the sky train. However, the traffic is bad. It can take a long time to get anywhere. Because of this, the taxis are also fussy about where they will take you and it can take awhile to find one who will go where you want sometimes. Don’t take this personally – even with our Thai friend dealing with them we still had lots of problems. For a game when stuck in traffic, we loved playing the “rainbow taxi game”. The taxis come in all different colours, so we would have a competition who could find all the colours of the rainbow, in order, first. It’s a good way to pass the time. For this reason, when it makes sense to do so, I would take the sky train. They are super quick and efficient. People would always stand so our kids had seats too. We also took the Metro which was easy and had nice escalators. Our budget on our most recent trip was AUD$110 a day. We kept to this in the Airbnb apartment with a fantastic lifestyle which included eating out all meals except breakfast and some massages. However, the bigger attractions (KidZania, etc) were on top of this cost. If you want to visit places like Kidzania, Dream World, SEA LIFE, you are going to need to factor in about another $100 per attraction. The kids loved Bangkok and settled into life here very easily. 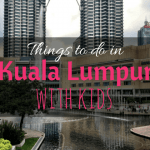 They especially enjoyed KidZania and always staying somewhere with a pool. They had no problems with the food and found the transport fun. They liked finding all the different coloured taxis. We had worried that spending 2 weeks here was going to be too long and we would be bored – how stupid! This was not the case at all and we loved spending all this time in Bangkok. In fact, if we weren’t so in love with our life in Penang, we would probably spend a couple of months here after Europe. J and I are city slickers, so being in a pumping place like Bangkok is great for us. It was also nice to spend some time in somewhere more low key in the Phra Khanong area. We are looking forward to stopping here again on the way back from Europe in September and doing some serious shopping. Do you love Bangkok? What’s your favourite part? If you are looking for more information about Bangkok, read this informative Bangkok travel guide. Disclaimer: This article contains affiliate links. This means that if you make a booking after clicking on these links then we may receive a small commission at no extra cost to you. 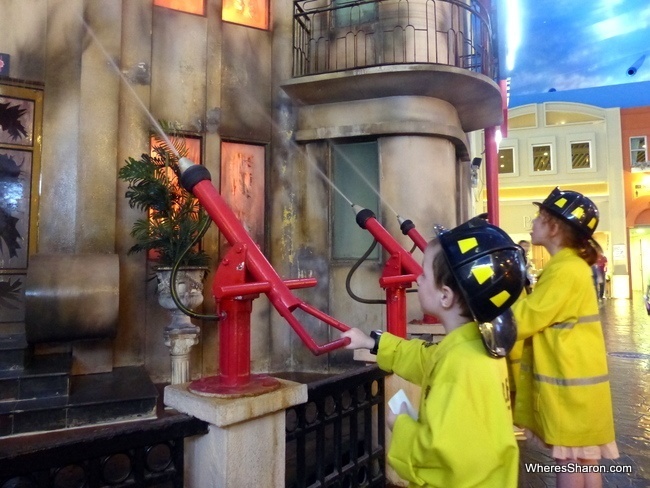 KidZania Bangkok – The Best Kids’ Attraction in the World! Hi, I’m new to your blog and I feel I have to thank you fo giving me confidence to travel with kids. There are lots of blogs for family travel but your the only one I’ve found with young kids. I’m planning on going to thialand with my 2 kids ( same ages as yours) and my husband next year for 6 weeks…..but its during the monsoon season. Do you think its worst time to go then? We were also thinking of flying into mainland Malaysia and heading up to Thailand. Do you have any recommendations on where to go, stay? Any idea would be appreciated. Thanks. I don’t find monsoon season a problem in those countries. The rain often happens at night and even during the day, it doesn’t usually rain for long. If you get wet, it’s not entirely unpleasant as its not cold. It does mean that its extra humid and it is more pleasant during the dry season, but I much prefer the monsoon over the hot season, and I wouldn’t let it stop me going. I have not written about Ao Nang, but we had a nice time there a few months ago and over on Railay Beach. We like Phuket. I loved Ko Samet when I went before kids. Chiang Mai is nice. I would like to go to some of the towns past there like Pai. In Malaysia, we love Kuala Lumpur and Penang. Johor Bahru was awesome with kids. I think Cameron Highlands area would be great too. My articles have links to where we stayed and some other suggestions 🙂 Good luck! Sharon, grat blog indeed. Congratulations!!! Do we love Bangkok? Of course we do, it is our favourite city. Our 8-y-o son Simon went there with us for the first time when he was 1,5-y-o. We fell in love with this city from the very first moment. Hi Patrick! That looks and sounds awesome. I hope to make it to Songkran one day. Hi Patrick! We sure are and thanks so much for your kind offer. We are all booked in already though for Warsaw and Wroclaw so we will have to give it a miss. I am sure we will be back some day though! Hubby has a Polish family connection. Bangkok is offering more child oriented amusement parks and services (like the ones mentioned in your post) to cater to family tourists. 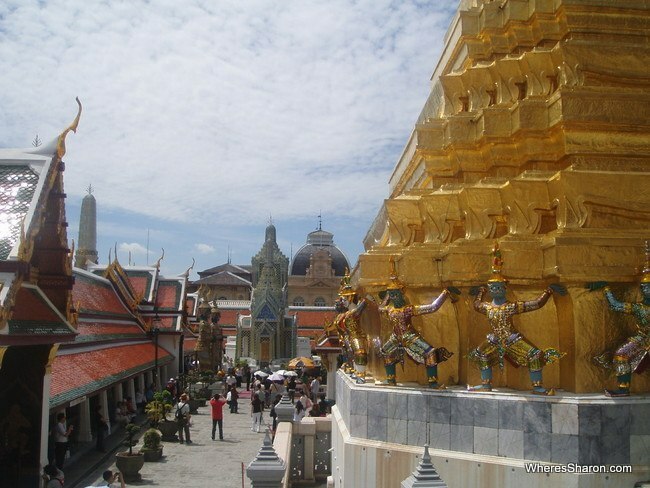 However, the historical and cultural sites in Thailand offer the most for families. They offer diversity and excitement, while at the same time providing a memorable and authentic learning experience. Loved the post – as I can relate to the content. We visited BKK 2 years back when our first kid was 2 years old. Only challenge we faced was with the public transport. They don’t have lifts in all station (we were staying at Silom) – and sometimes I have to carry baby cart up stairs. We didn’t travel on buses and didn’t look that exciting. I feel 4 and older is good age for kids to travel. Now she when checks out our pics says “daddy I don’t remember being there”…. Hi Farhan! I have loved travelling with my kids at all different ages so I can’t say I have a favourite age yet. There are pros and cons of each and I just try to enjoy the pros! It’s great now they are a bit older (3 and 5) that they get more involved in everything, but then the flip side is that its much harder for us to go anywhere unless they really want to go. At 2, we were able to enjoy far more adult attractions and I did enjoy that. I was definitely happier in Bangkok with kids that could walk upstairs though! Having lived in Bangkok myself with family I always thoroughly enjoyed going to the Children’s Museum near Jatutak. Week days it is very quiet! Also at a company we bumped into a few months ago that rents out bicycles with routing on the GPS-Tablets they provide. My kids loved it and have been back several times already. Kids bikes and child seats are provided as well. Have not yet been to bounce BUT certainly going to check that out. Thanks for your blog. Great read!! Hello! May I know if the kids also pay the entrance fee for Grand Palace or are they allowed to enter for free? I have a 9, 8 and 1 year old. Thanks! Hi Farrah! I did a google to try and get up to date information on this but it was very contradictory. I am not sure sorry. Hi sharon! I have read your blog over 10 times just this year alone! It was soooo helpful for our Malaysia/Singapore trip! I’m planning our trip to Bangkok now and looking at your list, i definitely want to visit safari world. i dont think their website is working though. But i saw your link to klook and saw that there are great ticket prices for safari world there. Before i buy, would you recommend that i buy from sites like klook or look for a local travel agency? Also did you use the BTS a lot or was it more convenient/cheaper to travel to and fro by taxi/uber? Thank you so much for sharing any info! Hi Lou-Ann! I am glad you found the site helpful 🙂 I am not sure what it would cost to buy tickets from a local travel agency so can’t answer that sorry. I know it is easy to buy from Klook though! We used the public transport when possible just because it the traffic in Bangkok is horrendous! It does not always save money but it does save sanity. When the kids were younger, it was trickier though as the sky train has sooooo many steps and we were stuck with taxis. I hope this helps! We are thinking of travelling to Bangkok and Phuket in either January or the start of April. How have you found the weather during these times? We’ve been in january and it was really hot but we’re a bit concerned about the wet and humidity in April. January is the perfect time for those destinations. I think April is still meant to be ok in Phuket but it is the hot season in Bangkok and so it gets very hot – if you thought it was really hot in January then you are going to struggle. I would definitely pick January over April if you can. Hi, I’m new to your blog and I don’t have kids yet. But when I was in Thailand and especially Bangkok I really enjoyed the Co van Kessel Bicycle tour. I think it is fun to do and also for the kids. 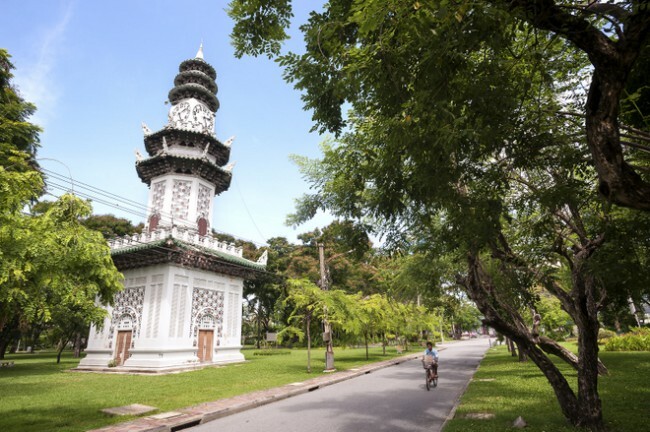 During the tour you see the true beauty of Bangkok on a bicycle. It was one of the fun things I did during my stay. Maybe in the future I try some of your tips with my kids. Thank you and I really like the blog. I also went to the Erawan National Park in Kanchanaburi and I think your kids would LOVE to go there! They can swim in the natural pools of the park and can climb up to the Erawan Waterfalls. For an impression of the park you can watch my video here: https://www.youtube.com/watch?v=4mwmzN4Xjlg If you would like to see how it is there. I really loved it there! Do not be discouraged by the rain, it was rainy season. Thanks for your tips Gino 🙂 Cool vid! Thanks for your great blog. We take our kids everywhere and love the fact you can stay somewhere longer without having to miss them :). We are traveling from the Us and we’re looking between staying in Bangkok or doing some island hopping. Our kids are 4 and 8 and was wondering the safety you felt in a city like Bangkok. Thanks in advance! Hi Justin! I have been to Bangkok a zillion times and never felt unsafe. It’s one of my favourite cities and I recommend it without hesitation 😀 If you have enough time, a trip that involved some time in Bangkok and island hopping would be awesome. Did you have to pay an entrance fee for Grand Palace? I’m planning to get there with my 6 years old boy. Yes there is – it’s not cheap but I am not sure what latest price is and what age kids have to pay. Im going to bangkok for a week and iwas wondering if i should bring my stroller (bugaboo cameleon 3 ) with me. Do u think it is a good idea to bring it? Hi Joanna! It depends what you plan to do. If you will mostly spend time places like shopping centres and taking taxis, then it could be handy. Bangkok’s streets and skytrain are not made for strollers and it could be more of a hindrance than a help. Wow great post.!! thanks for sharing with us. Bangkok is really a nice city with all kind of tourist attractions. there is a lot of things to do. I have been to Bangkok many times before and I am feeling so happy after reading your post because you have written much informative content about major tourist attractions in Bangkok. Thanks for the suggestion Nathan! Great Read. Really considering Kidzania but the prices seem pretty steep for a budget conscious family like ours. We will be there with our boys in December 2016, stopover on our way to Europe from Oz. Need any tips on SG/Malaysia, do let me know. Thanks a lot for such informative articles for people who are planning to travel with kids…I am planning to go with my wife and 10 months old kid in August this year to Bangkok.. You have already listed out the things so beautifully.. Thanks again. But request you if you could highlight the main places which cane be tried out in Bangkok with a 10 month old.. Thanks in advance..
Hi Sagardeep! Thank you 🙂 Honestly, with a ten month old I’d do whatever you wanted. They are still very pliable at that age and usually happy as long as they are with their parents. Just plan to have some down time every day unless your bub is fabulous at sleeping out and about. SO happy to have found you. We are going to Thailand with our children in Dec. I have a range of ages 23-11 (i have 4) I was looking up things to do with kids and it all seemed so elementary. My 11-year-old is mature I guess you could say with older siblings but wondering what you could recommend for all of us that is cultural yet fun. We were going to do a tour through Gate 1 but I spoke with them today and they said 11 and 15 may not enjoy their touring. So that is out I guess and we are now on our own. Did you spend time with the elephants at a sanctuary? My children want to ride them it seems. Any information would be great thank you for your time. Thanks for the great info! We are looking at taking our (will be 22 month old) in February next year for a four days in Bangkok and four days in Krabi. I’ve been to Bangkok twice without children, but my husband has never been. If we don’t take a stroller, what’s the best way to tote the tot around? We want to see and do as much as possible. Hi Jenipher! A carrier is the best way which can be tough with a 22 month old. It is my biggest gripe about Bangkok – that it’s super tricky with kids this age especially as sky train stations contain a zillion stairs and taxis are so slow. This really is a good list. There’s also a new Dinosaur Planet attraction opened recently at the new Em District in Sukhumvit (Phrom Pong Station) and the 4D cinema at Siam Paragon is always a win. Ooh thank you Allan. I’m sure my kids would love a dinosaur attraction! Nice post! It is just awesome. I am regular reader of your blog. Thanks for your informative trips its very helpful.i am also suggest to my friends to read your post. Excellent post. Some of these my wife and I didn’t know about. We will have to take our kids to play at the snow town.